Do you owned a Toyota Prius hybrid car? Due to its low fuel consumption compared to other conventional automobiles, the Toyota Prius is fast become the ideal family sedan. However, because it is a hybrid car, getting the car serviced can be a chore. If you are good with hand tools, you can actually do the maintenance on your own. If you are planning to go on a Do It Yourself (DIY) approach, the Toyota Prius Repair and Maintenance Manual by Bentley Publishers will come in handy. The guide covers Prius model from the year 2004 to the latest 2008 model. Bentley Publishers has come out with a very compressive guide with over 640 pages and 830 photos, illustrations and diagram of the Prius. The topics covered in the manual ranges from power inverter, hybrid motor, generator, electric air-conditioning compressor, power steering, transmission, regenerative braking etc. The most common maintenance needed to be done on the Toyota Prius is replacing the gas, oil and air filter. It is a very simple process if you know the proper procedures. Some workshops will charge you a couple of hundred dollars just to replace all the filters plus workmanship fee. If you are willing to learn the step, you can do the filters replacement yourself and save a lot of money. 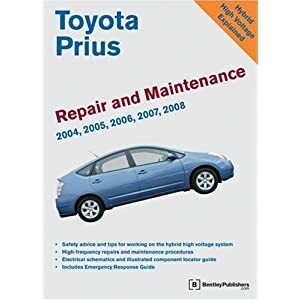 The Toyota Prius Repair and Maintenance Manual by Bentley Publishers has received a 5 star rating from Amazon.com user reviews. Among all the other Prius repair guides, this is the best due to the bulk of information included. The manual is now available at Amazon.com for $44.07. Click on the link on the right to buy a copy now! One of the key components in a Toyota Prius is the nickel-metal hydride (Ni-MH) battery system for the electric motor. Getting the battery replaced at a Toyota service centre can cost you as much as $4000! Is there a cheaper option? As a matter of fact, the guys at www.hybridbatteryrebuild.com can get the battery replaced for under $500. Click on the link below to learn how.